Advanced manufacturing program and research at U of T Engineering are creating next-generation technology while preparing future engineers to lead in industry. We are working with NanoXplore to create a hybrid graphene and foamed plastic material that stands to impact the way many products are made, from smartphones to sensors. TIAM continues to establish partnerships with the manufacturing sector that maximize the impact of transformative technologies developed by its world-renowned researchers. OCCAM fosters collaboration between universities and industry, enabling interactions that traverse the traditional boundaries between science, engineering and medicine. IRM conducts research on robotics and mechatronics through collaborative research projects and innovative educational programs. CACT conducts fundamental research—experimental, analytical, and computational—in the areas of thermal spray coatings and plasma processing. Our Master of Engineering students can choose from a wide range of technical emphases including Advanced Manufacturing, while all engineering graduate students have the option of pursuing a Robotics & Mechatronics emphasis. Undergraduates in the Engineering Science program can major in Robotics, while students in our core engineering disciplines can pursue minors in Advanced Manufacturing and Robotics. Support the future of advanced manufacturing research. It’s Carlos Menezes’ job to keep things moving. Thousands of things: tea kettles, barbeques, car parts, sleeping bags, garden gazebos. 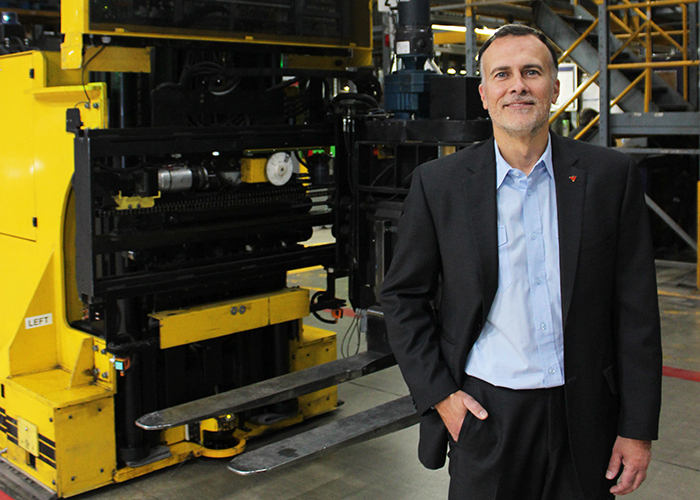 From his vantage at the centre of Canadian Tire’s vast supply chain, he tracks products from more than 2,000 suppliers worldwide. Shipped across oceans, onto trains to his four national distribution centres, onto trucks and into 500 Canadian Tire stores, where you lift them off the shelf in perfect condition and take them home. Like any extraordinarily complex system, it benefits from precision engineering — and as vice-president of distribution and operations planning for Canadian Tire, U of T Engineering alumnus Menezes (IndE 9T3) has built his career on continuously fine-tuning it.